The Winter Olympic sport of Biathlon is a discipline which combines both cross-country skiing and target rifle shooting events. The sport was first developed as a training exercise for Norwegian soldiers - with the first competition held in 1767. The cross-country skiing component covers a distance of 7 to 20km depending which event of the biathlon contest. In the shooting component, .22 calibre rifles are used at a range of 50 meters. At each stop, competitors have five bullets and five targets to hit. Each miss in the sprint, pursuit, and relay events results in a 150-m penalty loop. Each miss in the individual event adds one minute to the athlete's final time. At the 1924 Games, a precursor event to the Biathlon was an event called Military Patrol. Miliatry Patrol was also a demonstration sport in 1928, 1936 and 1948. Biathlon made its official Olympic debut at Squaw Valley in 1960. Women's biathlon made its Olympic debut in 1992 in Albertville. The Mixed relay biathlon was added to the program in 2014. In Squaw Valley 1960, Sweden's Klas Lestander won the first-ever biathlon. Mechanical targets for the Biathlon event was first used at the 1980 Winter Olympics in Lake Placid. 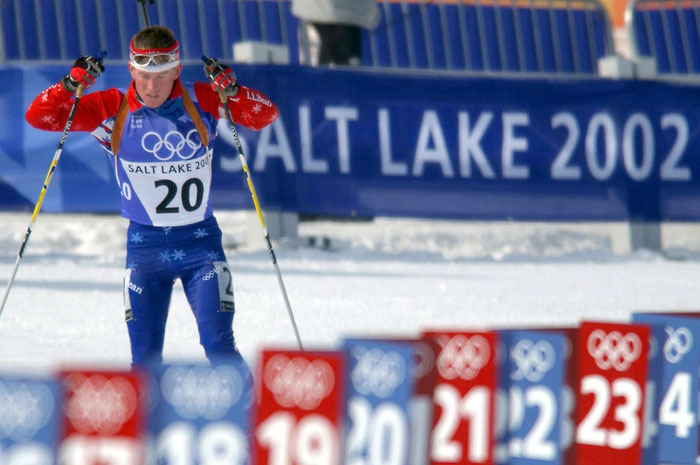 Biathlon athlete Ole Einar Bjoerndalen of Norway is the most successful ever Winter Olympian in terms of total medals won. In 2014 the 40-year-old moved his personal medal tally to 13, eight of them Gold. In the women's events of 2014, Belarus's Darya Domracheva made history as the first female to win three Biathlon Gold medals at the one Games, winning the Individual, Pursuit and Mass Start events. Military Patrol at the Winter Olympics.